Learn More: Follow the Facebook event for more information, including what you can do if you can't show up in person. 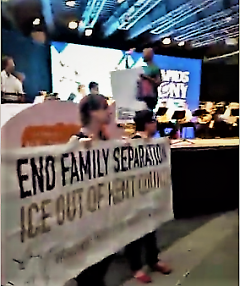 In the last three months, organizers from Movimiento Cosecha GR and Grand Rapid Rapid Response to ICE have worked in partnership on a campaign to #EndTheContract between Kent County and Immigration and Customs Enforcement (ICE). The contract, approved by the Kent County Commissioners and adopted by the Sheriff's department in 2012, pays Kent County at least $85 per day to hold a person for detention by ICE, which accumulated into nearly $18,000 received by the Kent County Jail in 2017. During these last three months, Cosecha and Rapid Response organizers have used a range of tactics to try to end the contract and build a movement in support of dignity, respect, and permanent protection for immigrants. We have appealed directly to our elected officials, which included hours of testimony directly from Kent County residents who are personally affected by the threat of ICE coming for them or their loved ones. Organizers have also participated in sit-ins, civil disobedience, silent protest, dance parties, and street theater. As national headlines focus on ICE, it is important to remember that the agency does not act alone. Day in and day out it relies on a variety of institutions we are all a part of in order to function. ICE is supported by mayors, police departments, and county commissioners that allow ICE to use local jails to detain families, by private tech companies who develop their surveillance technology, and by airlines who deport people. (Many of these entities are cancelling their contracts with ICE.) ICE is also supported by property owners who rent space for their offices. 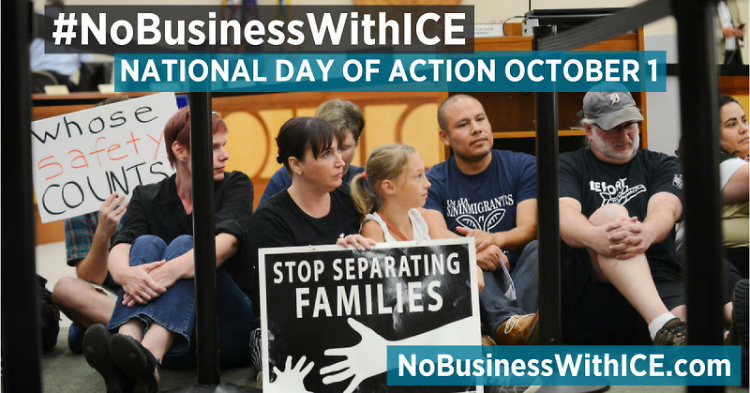 To underline this point, on September 20 we expanded our message to #NoBusinessWithICE. We worked together to briefly disrupt the opening ceremonies of ArtPrize. Our action, which included fliers, was to let people know that the Waters Center, managed by Edmark Development at 161 Ottawa NW, rents space to a Department of Homeland Security office. It is one of the locations of ICE operations in Kent County. The Waters Center is also an ArtPrize venue. During the interruption, people held banners, chanted, and symbolically destroyed a physical representation of ICE—a cardboard sculpture of an ICE jail cell. 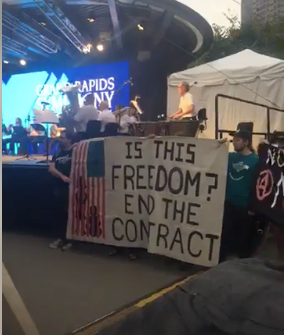 This was to demonstrate that by not working with ICE, we the people - the people that make up ArtPrize and the people who make up Kent County - can pull out the pillars that hold up the many systems that allow ICE to function. We can choose as a community not to be complicit with ICE and the agency’s continued harm to our immigrant neighbors. The range of responses to our actions indicate a lack of understanding of collective organizing and a lack of understanding of the small, subtle, institutionally entrenched ways that racism and xenophobia work. They are the same reactions received by marginalized people all over the U.S. who organize for social change. It’s important to note that Movimiento Cosecha is an immigrant-led, nonviolent movement that prioritizes building collective power with people. Cosecha does not work within established channels of power like party politics. Likewise, Rapid Response organizing follows the leadership of immigrants. All of the #EndTheContract and #NoBusinessWithICE actions have been nonviolent; there are trained marshals and medics at the actions to keep people safe. At no point have any actions put anyone in danger, except from violent reactions from the police and the state. Indeed, part of the point of both principled and strategic nonviolence is to demonstrate the violence of systems, conventions, and the state. This response both underestimates the political analysis and intelligence of immigrant organizers, and illustrates an underlying assumption of white supremacy: that only big governmental actors or overtly bigoted people are complicit in racism. Under this logic, it’s not fair to call for accountability from anyone who isn’t a state- or national-level decision-maker, particularly nice people who are just trying to do their jobs. But we have called for accountability from these local influencers - the Kent County Commission and ArtPrize - precisely because racism and anti-immigrant xenophobia are systemic, and depend on the inaction and complicity, willing and unwilling, of all of us and our organizations, even on the local and regional level. In a small community we have personal relationships and history with each other, so it is understandable when people who have been targeted by actions to reach out to people they know to talk one on one. The problem with this as a practice is that people with money and power in Grand Rapids do not know or feel comfortable with many immigrant organizers or people directly affected by ICE. Immigrant leaders are left out of discussions, whether purposely or not. After the disruption of ArtPrize, an ArtPrize organizer reached out to one of the white organizers with Cosecha for a private meeting to try to convince them, and through them all of Cosecha and Rapid Response, not to target or disrupt ArtPrize events. This puts pressure on an individual to speak for a community who has been perfectly capable of speaking for itself through its actions. Disruption tactics are a tool of people who don’t have access to money, to microphones, or to power structures. Disruption of public events in public places has been used in countless movements, especially during the Black Liberation Movement (also referred to as the Civil Rights Movement), which Movimiento Cosecha and Rapid Response to ICE both look to. When county commission meetings are held during working hours, when powerful people fail to show up for meetings planned by immigrant organizers or refuse to listen to the concerns of immigrants, and when ArtPrize is planned by and caters to members of the professional class, it is never an undocumented immigrant’s “turn” to speak. It has been suggested that by calling for an end to ArtPrize’s relationship with the property management company that leases to ICE, our actions are “censoring” the artists of ArtPrize whose work is hanging in that location. If ArtPrize were to end its complicity with ICE by removing the Waters building from its venues, there are still ways for the artists whose work is in that space to share their work. It’s good to remember that the definition of censorship has to do with government limiting the speech of its residents. To confuse a demand to end complicity in harm with “censorship” cheapens the ways that the government steals the freedom and well-being of our immigrant neighbors through arrest, detention, and deportation. During our ArtPrize disruption, the ArtPrize organizers had, and retained, the microphones and working sound system. The event continued after we left. Yet ArtPrize security officers tried to steal our banners and laid hands on and physically shoved at least three protesters. All this happened in a public park where we had every right to be present. ArtPrize will continue to be a powerful institution that will bring a lot of money and people into Grand Rapids. Yet, in the days after our disruption at ArtPrize, a meeting place we had previously secured, that is funded by the city of Grand Rapids, was pressured to rescind its permission for us to meet there. Again, these are common responses by those in power to movements organized by marginalized communities, particularly people of color. Racism and xenophobia are upheld by small actions, just as ICE relies on our small actions and inactions to continue. If you also feel that each local entity can do its part in stopping ICE from separating families, and that our community must make this clear to local decision-makers and influencers, join us at the Calder Plaza at 6:30 pm on Monday, October 1st. We will be participating in a National Day of #NoBusinessWithICE with cities like Santa Cruz, CA, New York City, Boston, and Trenton, NJ. Follow our Facebook event to find out more, including what you can do if you can't show up in person. Sarah Doherty and Amy Carpenter co-authored this article with input from other volunteer organizers with Movimiento Cosecha GR and GR Rapid Response to ICE.